What is lacking in the initial conversations between Mr. Amadou and Dr. Ofri? What causes the communication errors between Dr. Ofri and Mr. Amadou when he attempts to tell her his medical issues? Do you think that if Dr. Ofri had done things differently, the outcome might have been better? How much of the situation was Mr. Amadou’s “fault”? Have you ever experienced a similar situation, in which communication between you and your physician, resulted in an issue that could have been avoided? Why are Morgan Amanda and Juliet able to build such a strong connection from the start of their doctor-patient relationship? What enables them to communicate effectively within their first visit? Should doctors and patients try to establish a personal connection when first meeting? Or does this pose the risk of jeopardizing the professional relationship moving forward? What do you think about Dr. Ofri’s observation that unlike when buying a car or a house, people invest their health with a doctor based on just a few minutes of conversation? Dr. Ofri is surprised to find that letting patients talk without interruption at the beginning of a visit doesn’t “sink” the visit. And, she finds, it ultimately proves much more effective than the doctor leading the conversation. Based on Dr. Ofri’s findings, do you think allowing patients to speak without interruption at the beginning of a visit should be implemented as the standard for medical visits? Marije Klein saw two different doctors about her chest wound, and they gave two very different assessments. Do you think this is a reflection of communications differences or of variability in the practice style of individual doctors? Dr. Ofri suggests that a certain amount of intimate connection and understanding is something that doctors should aim to establish with their patients. Do you agree? Does this cross a professional line? Do you agree with Dr. Ofri’s assertion that direct, one-on-one communication between patients and doctors is more effective in making a diagnosis than relying on technology? If so, why? Do you think more assertive patients receive better treatment than docile patients? How does assertiveness on the part of patients improve—or impede—communication with their doctors? Why are more assertive patients often labeled as difficult or hard to work with? Do you think this stereotype is the fault of doctors not realizing patients’ concerns? Or patients lacking faith in their physicians’ abilities? Or both? What do you think categorizes a patient as “noncompliant”? Is this a fair judgment of a patient? How do issues of nonadherence to medical care impact the relationship between the patient and doctor? Do you agree that professional boundaries limit the ability for doctors and patients to fully connect? Why or why not? Do you think Tracy could have avoided her stay in the ICU if she had been more honest with David (and herself) about how she was taking care of herself? Did David’s own issues and self-perceptions contribute to the breakdown of medical care? How could David and Tracy have built a better relationship from the start to establish an open and candid dialogue about her diabetes? Or did it require a “crisis” to jolt both of them toward more honesty? Do you think placebos should be used to alleviate a patient’s pain? Do they pose an ethical dilemma? Dr. Ofri shared a family photo with one of her patients, but with Anita Lyons she ultimately decided not to share any of her personal life. Do you think that sharing personal information improves or harms the doctor-patient relationship? Why do you think most doctors roll their eyes when they hear about research on the “soft” skills of medicine, such as communication? Should hospitals be required to have a Chief Listening Officer as a liaison between patients and doctors? Why or why not? Do you think it would be more effective to have doctors trained as Chief Listening Officers, or is a neutral party necessary for patients to feel comfortable discussing their concerns? For Corine Jansen, it seems like it was her early experiences with tragedy and pain that made her an especially astute listener. How might people acquire these skills without having to experience tragedy? Why do you think that health-insurance companies have trouble with the idea that medical visits that entirely consist of talking and listening should be reimbursed at the same rate as medical visits that involve procedures? Does the desperation to alleviate pain and receive treatment cloud patients’ ability to properly listen to their physicians? Would patients better comprehend the advice of their doctors if they improved their listening skills? Do you believe the early personal connection between Morgan Amanda and Juliet jeopardized their professional relationship? Or was their relationship ultimately doomed because neither could truly “hear” the other? Should doctors and patients be cautious of how intimate their relationship becomes? Why is there a staggering disconnect between the percentage of doctors who believe patients leave the visit with the correct information and the large number of patients who miss important information? Why do patients remember nurses’ names more than they do doctors’ names? Does the electronic medical record help or hinder retention of information? How can both patients and doctors fix this so that information—like a medical diagnosis, the physician’s name, or the appropriate treatment—is properly communicated and remembered? Do you agree that full disclosure is the best form of communication when dealing with medical error? How might it risk making the situation worse? Is medical error simply a consequence of human imperfection? Should medical personnel be held to a higher standard than people in other professions? Is it ethical for a doctor to withhold information from patients in situations of medical error? Do you think it’s acceptable for doctors to “choose their words carefully”? As a patient, would you want full disclosure about a medical error? What if the error did not cause you any harm? If a medical error happened to you, how much would you want to think about the effect of the error on your doctor? Why do you think that Bernice Ruger wasn’t taking her medications? Do you think it’s actually possible for doctors to view and evaluate the patient separately from the illness? Why do you think even well-meaning doctors are “blind” to issues such as domestic violence and literacy? How can doctors make patients feel more comfortable disclosing the uncomfortable aspects of their life when discussing possible causes for poor health? How can doctors assess this information without coming across as prying or judgmental? What do you think about the use of terms such as “obese” versus “overweight”? Do you think doctors use medical jargon out of habit, or do you think it indicates an effort (perhaps unconscious) to create a professional distance from the patient? Should doctors simplify medical terminology for patients, or might that be perceived as condescending? Researcher Jane Ogden makes the statement that doctors need to induce “some amount of anxiety in order to help people to change behavior.” What do you think of that? Dr. Ofri traces the path of how she refers to death, from her time as a student until she became a senior physician. Do you think the metamorphosis was ultimately positive or negative? How do you feel about Dr. Ofri admitting her discomfort in examining an extremely obese patient? Do you think doctors should be held to a higher standard than other people when it comes to issues of bias? Do you think that doctors can purposefully eliminate bias? Should patients be expected to work on developing a personal relationship with their physician as a method for combatting the possible judgments by the doctor? Do you agree with Dr. Ofri that having doctors “act as if” they are not biased is an effective way to prevent medical bias and judgment? Or is it hypocritical? Chapter 14: Can It Be Taught? Do you think that skills as such as listening and communicating are innate? Or can they be taught? There is only a finite amount of teaching time in medical school. Requiring courses on communication and listening would, by definition, mean fewer hours for other medical subjects. Is the trade-off worthwhile? Do you think the parallels that Dr. Ofri draws between listening in music and listening in medicine are valid? If doctors were trained to properly communicate with patients, do you think there would be an improvement in medical outcomes? Or would everything just “feel” nicer, but the outcomes would likely be the same? How did you react to the “break-up” between Morgan Amanda and Juliet? Do you think Juliet had a professional obligation to end things sooner? Do you think Morgan Amanda had an unrealistic view of what physicians could—or should be able to—accomplish? Looking at the entire tragic arc of Morgan Amanda’s case, do you think that impaired communication over the years ultimately played a role in the outcome, or did the virulence of the disease simply steamroll everything? Chapter 16: Can We Talk? How did you react when you read about all that was going through Dr. Ofri’s mind while she was listening to her patient Evelyn Osorio? As a patient, do you really want to know what goes “inside the sausage”? Anatole Broyard wishes that his doctor “would give me his whole mind just once.” Do you agree that doctors should give their patients their “whole mind,” that is, their undivided attention, during a visit? Is this even possible? When Dr. Ofri attempted to incorporate the research findings into her own practice, she did not necessarily find instant—or any—improvements in her patients’ health. She concludes that “the process, not the product, was the most valuable part.” Do you agree with this? In this chapter, Dr. Ofri revisits her interaction with Mr. Amadou (from the first chapter). Do you think her analysis of her own role in the miscommunication is accurate, or does she overstate what she might have been able to control? In Dr. Ofri’s final assessment of how doctors can better communicate with their patients, she notes that doctors need to make a conscious effort to listen as opposed to talk during visits. Is this suggestion realistic? 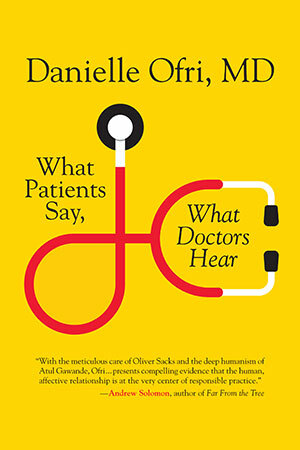 Do you think that if more doctors focused on listening, there would be an increase in the quality of patient care?